Gilder Lehrman Collection #: GLC02429.34 Author/Creator: Hemans, Nancy A. (b. 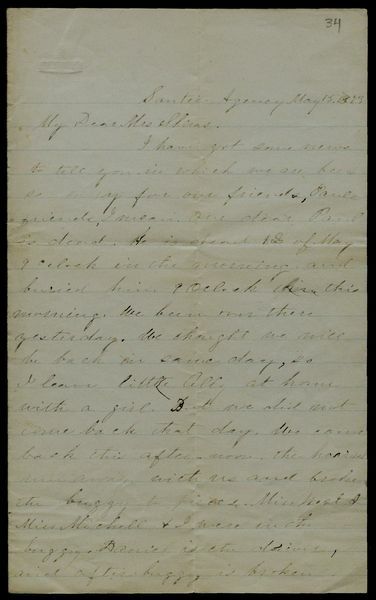 1843) Place Written: Nebraska Type: Autograph letter signed Date: 15 May 1873 Pagination: 3 p. : docket ; 20.5 x 25.1 cm. Summary of Content: Discusses the death of their friend Paul Mazakute, an Indian clergyman who long-suffered from consumption. Explains how their buggy broke down after the funeral. In a post script, indicates that they might get photos taken. "Our dear Paul is dead. He is dead 12 of May 9 o clock in the morningâ€¦We been over there yesterdayâ€¦But we did not come back that dayâ€¦the ...horses run away with us and broke the buggy to piecesâ€¦We were in the mist of the prairie waiting for tame about two and half hour, and it was raining hard too. oh! Daniel is so tired! Was laid in the bed in this whole afternoon. But oh so glad that Paul get over all the troubles and sufferings in this worldâ€¦He is rich now, and he is with the angles now. I don't shed a tear over him, because he is better of in heaven now. I only felt so sorry for his wife and those childrenâ€¦What do you think I shall do if Daniel is leave me and so many children as that? I am sure I can't tell what shall I do."